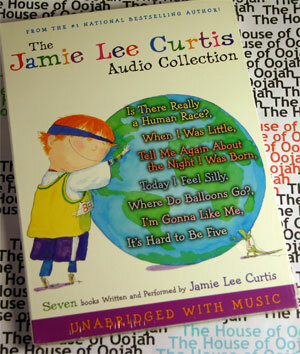 Seven of Jamie Lee Curtis's very popular books to grow by available unabridged on audio! Is There Really a Human Race? : This funny and touching fantasy is a dialogue between child and parent reminding us that being human is all about making good choices and relishing life's journey. It's Hard to be Five: Learning How to Work My Control Panel: Learning not to hit? Having to wait your turn? Sitting still?! It's definitely hard to be five, but this encouraging book makes the struggles of self-control a little easier, and a lot more fun. When I Was Little: A Four-Year-Old's Memoir of Her Youth: In this simple, childlike celebration of personal identity, a little girl looks back on her childhood from the lofty height of four and half years, and discovers that she is a unique individual. Tell Me Again About the Night I Was Born: "Tell me again how you would adopt me and be my parents . . . ," a heartwarming story of not only how one child is born but also how a family is born. Today I Feel Silly & Other Moods That Make My Day, helps kids explore, identify, and even have fun with their ever-changing moods. Where Do Balloons Go? An Uplifting Mystery: When one little boy accidentally lets go of his balloon, his imagination takes him on a journey. This delightful mystery about letting go uses imagination as a tool to deal with loss. I'm Gonna Like Me: Letting Off a Little Self-Esteem, whimsically demonstrates that it's important to like yourself every single day—no matter what. Jamie Lee Curtis (born November 22, 1958) is an American film actress and an author of children's books. Although she was initially known as a "scream queen" because of her starring roles in many horror films early in her career, Curtis has since compiled a body of work that covers many genres. She has received an Emmy Award nomination and two Golden Globe Awards. Her 1998 book, Today I Feel Silly, and Other Moods That Make My Day, made the best-seller list in The New York Times. She is married to actor Christopher Guest (Lord Haden-Guest) and, as the wife of a Lord, is titled Lady Haden-Guest, but she chooses not to use the title when in the United States. authorized by A.A. MilneÃ�ï¿½Ã¯Â¿Â½Ã�ï¿½Ã�Â¯Ã�ï¿½Ã¯Â¿Â½Ã�ï¿½Ã�Â¿Ã�ï¿½Ã¯Â¿Â½Ã�ï¿½Ã�Â½s son, Christopher Robin.